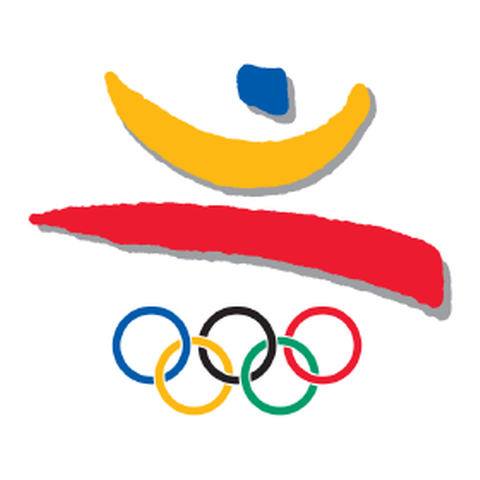 The official emblem, designed by Josep Maria Trias from Barcelona, depicted a dynamic human figure in a stance that suggested someone jumping an obstacle (which consisted of the five Olympic rings). The simple, gestual lines reduced the characterisation of the figure to the head (in the blue of the Mediterranean), the arms (the yellow of the sun and wide open in sign of hospitality) and the legs (a vivid red). At the 1992 Summer Olympics in Barcelona, Spain, Athletes from Turkmenistan competed under the Unified Team. The torchbearers came from the following categories: Olympic volunteers from various regions in Spain; torchbearers chosen by the town halls of cities crossed by the relay who could each choose one runner; the partner companies of the relay and the Organising Committee; people from among the general public who put forward their candidature. 367 km in Greece, 5,940 km in Spain, of which 1,490 km was by bicycle and 4,450 km was on foot. Transport by ship between Greece and Spain excluded. Cobi is a humanised Pyrenean mountain dog, in a “Cubist” style. While his expression and three spiky hairs are the same, he has an impressively large wardrobe. Reactions to Cobi were mixed when he was first presented, but he grew in popularity during the months leading up to the Games, and ultimately proved a huge success. A competition by the Organising Committee between six designers decided the choice of mascot. The jury of experts selected Mariscal's submission. Mariscal's contribution to the Games in Barcelona was not limited to Cobi. He also designed characters for the Opening Ceremony representing Spanish painting and culture, as well as the font used for the diplomas awarded to the first eight competitors in each event. A series of 26 episodes of the cartoon “The Cobi Troupe” related the adventures of Cobi and his friends. The aim of the series, whose target audience was 5-12-year-olds, was to make the mascot more widely known and promote the Games in Barcelona. The rights were bought by 24 television channels.